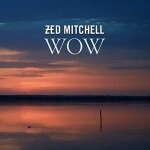 Share the post "Album review: ZED MITCHELL – WOW"
Zed Mitchell is a German based guitarist with a beautiful touch and tone. His playing owes much to the Peter Green meets Mark Knopfler school of feel, meaning ‘WOW’ is a very laid back album which in its best moments provides the perfect framework for Mitchell’s majestic guitar playing. He’s worked with everyone from Pink Floyd to the Munich Symphonic Sound Orchestra and composer Elmer Bernstein, a fact evidenced by the musical substance here. ‘WOW’ is his six solo album. It finds him in a reflective mood on series of relationship and family songs. From Manfred Pollert’s front cover sunset and seaside photography to Zed Mitchell’s own signature tone, this is an album that aims to make an emotional connection. The funky feel and guitar-led groove of ‘Wonderland’ for example, has a catchy hook, but is hampered by lyrics that fail to evoke the title, which is shame as once again the subtly crafted guitar resolution is well worth the wait. No matter, ‘WOW’ is worthy of your attention for the guitar playing alone. From the opening ‘Black Swan’ – a call to the new generation to stand up and seize the moment – he imbues his guitar playing with a sumptuous tone and occasional subtle volume swell for good measure. He’s a guitarist who instinctively knows the value of space and dynamics. He’s close to Peter Green on the slow, but imperious build of ‘We Are Not Alone’, while the guitar part on ‘Now Is Our Time’ puts you in mind of Fleetwood Mac’s ‘Albatross’, but the song is slightly marred by poor phrasing and half spoken lines. He’s in a more resilient mood on the aptly titled ‘Take It On The Chin’, a song about self-affirmation that features a gentle weepy toned solo. He adds a tinge of regret to his emotional palette on ‘The Train Has Gone’, on which his guitar cleverly evokes the narrator’s feelings. ‘Tomorrow’ is a stylistic departure. It’s jazzy shuffle featuring David Haynes’s gentle brush strokes, a subtle change of Mitchell’s guitar tone and some belated synth horn parts from Sascha Kühn. Mitchell saves his best for last on ‘The Man In My Mind’. Apart from the great title, the song benefits from a better vocal – think a Mark Knopfler’s close to the mic whisper – before he adds superb slide and intricate guitar that again perfectly evokes his lyrical meaning. Despite its exclamatory title, ‘WOW’ is a beguiling set of heartfelt songs all intricately interwoven by Zed Mitchell, a guitarist who brings every nuance of his experience to bear on each note. This entry was posted in ALBUM REVIEWS, ALBUM REVIEWS (Mobile), All Posts and tagged blues, David Haynes, Elmer Berntstein, Fleetwood Mac, funk, guitar, Manfred Pollert, Mark Knopfler, Munich Symphonic Sound Orchestra, Peter Green, Pink Floyd, rock, Sascha Kühn, WOW, Zed Mitchell. Bookmark the permalink.